Windshield has decided to spring a leak on me; it's got a nice crack at the top. I *think* it's leaking under the rubber seal, and not through the starburst. I see that Permatex makes something, and I've read to not use silicon. Any harm in trying? Windshield has seen better days but if I can milk this one longer... I figure, on a '99, the air bag is not using the windshield in this area for what it does (and at this point I doubt the airbag is doing much anyhow). I checked, and the rubber seal in this area is rock hard. Does not budge. You probably have some rust under the gasket causing the leak. Seen many trucks like this. Slap on the sealer and see if it helps. The alternative is removing the windshield, fixing the rust, replacing the windshield and gasket - talking $2000+ if done right. Yes, and the rust causing the leak is likely on the pinch weld underneath the windshield, not just beneath the visible gasket on the outside. My Sienna had that same problem and I ended up taking the old windshield out myself, grinding down and cleaning the pinch weld, epoxy primering it myself and having a local shop install a new windshield. All in all including the quart of epoxy primer it was about $450. In my case you could push on the windshield from the inside and see it slightly lift up and move so I knew it had become unbonded. Hmm, did not think to push on it, see how it feels. If it pushes out I'll have to bite the bullet and have it replaced--I can't see any shop willing to put back in a busted windshield. I like the car but I'm not about to spend $2k fixing this! Not when 3 cents of duct tape would "fix". Do they sell Dupli-Color duct tape? On a serious note though, if you have any intention to keep the car at all you should find a way to correct the water leak. Water running down into the instrument panel and onto the floor (soaking the carpeting in my case) can cause all sorts of problems besides just being annoying. You are correct no one will reinstall a broken windshield, and even removing an intact one without breaking it isn't that easy. The adhesive that isn't compromised is very tough and it's very easy to nick the edge of the glass with the removal tool. I imagined trying to save mine but about halfway through the process I chipped the glass with the cutting wire by holding it at too steep of an angle (trying to not scrape the instrument panel). I've had many a windshield develop leaks at the seal. If you can remove the window, you could properly seal it with minimal material cost. It's been thirty years, but I remember it involved using a special window primer, then a special caulk. This is after prepping the area from all rust and old material. At that point, you could consider putting in a new window. I'm not sure how much they cost for the DIYer. Oh I agree, with spring coming around I'd rather fix it now than later. I like the car but let's be real: it's a $1,500 beater, with shot paint, 20 years old with 173k on the clock, etc. Putting say $400 into a new & well sealed windshield is ok, putting $2k into "doing it right" is not ok, and putting on $5 of cheapo sealer most ideal. I've had good luck sealing the top gasket with plain old outdoor silicone caulking. The windshield wasn't cracked though, but the installation was poor. Had that vehicle for 2.5 years without any problems. Last edited by KrisZ; 02/21/18 10:13 AM. 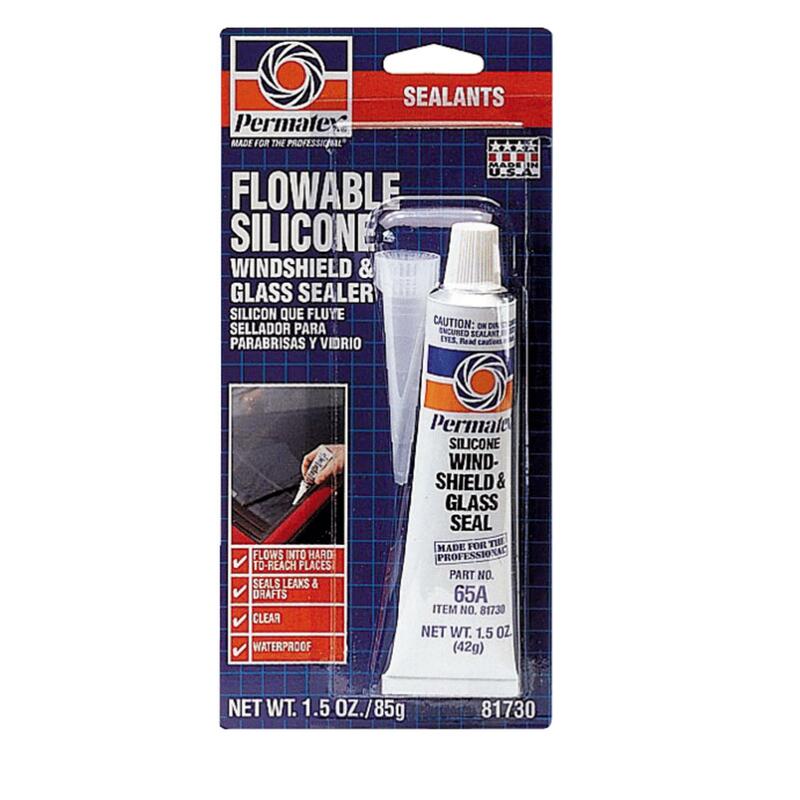 There are these low viscosity "flowable" silicone products that are made to seal leaks around the windshield. They might work for a while, but if your pinch weld is rusted like mine was then I doubt it would work for long. The rust is just going to spall off and it will start leaking again. Yeah I'd just get a big tube of clear silicone for a caulking gun and glue the heck out of it. Scratch up the surface of the gasket and the paint. Splurge on a roll of Gorilla Tape. I know, but the stuff makes makes ordinary look wimpy. The only way you'll fix it is to pull the glass, clean the mounting surface and reseal with fresh urethane. Squirting anything on the outside won't help. The right way would be pull the windshield, repair any rust and install a new one complete with fresh moldings. You can find a Chinese windshield for a Camry cheap but it's a YMMV deal for glass quality and install. That crack is underneath the molding - the PVB inner later is looking OK(no moisture-induced clouding of the laminate) but the pinchweld is a critical area. Last edited by nthach; 02/21/18 05:25 PM. I briefly considered buying a piece of glass and trying to follow the FSM procedure for installation. But since I had done the removal and all of the prep work already, the cost for installation was minimal and came with a warranty which wouldn't have been the case had I done the work myself. They did use Fuyao glass which although made here in the US is a Chinese owned company. The quality is excellent with no distortion I can see in the glass even at the corners. I'm happy with it. I looked the other day, and I think I see a small hole right in the center of the starburst. I think it's literally leaking through where it got hit. I'm to seal that and see if it fixes the problem. I pushed on the windshield and it seems tight. OTOH I think I feel some residue on the inside, maybe the PO already sealed it, once before.